If there is anything that the Filipino loves more than the underdog, it is somebody who has his back against the wall and fighting for survival. Thus, the script for the Philippine National Football Team in the Suzuki Cup could not have been written better. 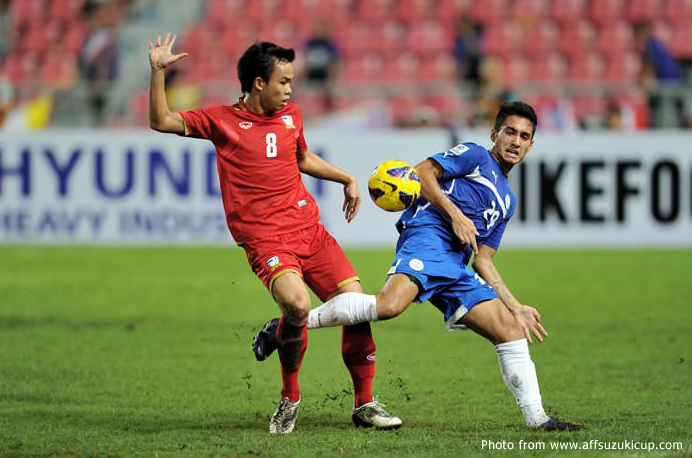 Narrowly beaten by the Thais in their opening match in a game when the Thais resorted to trickery both legitimate and otherwise, the Filipinos faced the Vietnamese in a match when they were not only the underdogs but also one in which they were fighting for their lives. Emelio ‘Chieffy’ Caligdong, he of the Air Force and homegrown lad, scored late in the match to ensure that the Filipinos lived to fight another day. The Rizal Memorial, thus, awaits the Azkals, who will be playing their first-ever Suzuki Cup semi-final on home soil. That the stadium is named after another of the country’s national heroes is just another twist to the script and an incentive for the Philippines’ modern day football heroes to see the script through to the finish that this fairy tell deserves. As it was in the Challenge Cup when the Philippines lost its opening match but went on to qualify for the semi-finals by defeating India and Tajikistan in their next two, the win over Vietnam offered the Filipinos the opportunity to reprise their heroism in Nepal last summer. The stage could not have been better set for the Philippines to take on Myanmar, curiously the very same country that the Filipinos played against to earn passage to the semi-finals of the 2010 Suzuki Cup. As romantic as scripts go, the match was played on the anniversary of one of the Philippines’ national heroes. 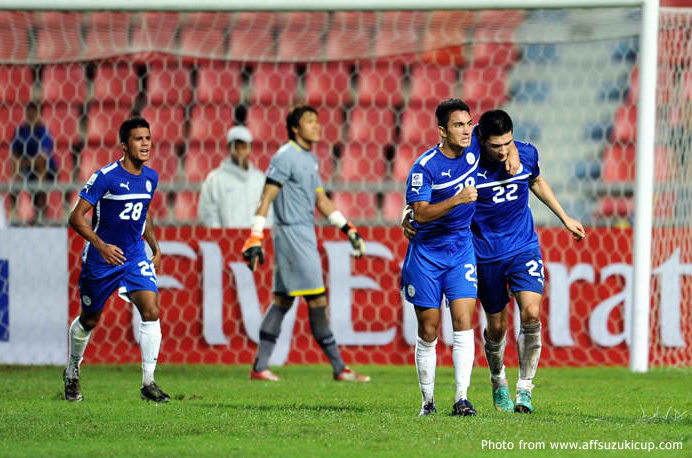 For the Azkals to duplicate its semi-final exploits in the 2010 edition of the tournament, heroes were indeed needed. They came, all eleven of them – plus the substitutes. Myanmar were soundly beaten 2-nil. It was, perhaps, remarkable that the first of the heroes was one who sang the national anthem with a decidedly British accent. 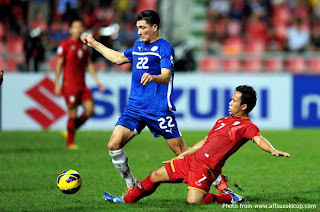 Phil Younghusband, mauled by the Thais and so off-colour against the Vietnamese, made sure he brought his shooting boots to the match. Looking livelier than he did in the Philippines’ opening two matches, Younghusband tried his luck from distance in the 6th minute and then stung the Myanmar goalkeeper’s gloves with another rasping drive ten minutes later. It took just another minute after the restart for Younghusband to put the Philippines in the lead. Collecting a long diagonal cross-field pass by Jason de Jong, he cut inside past two Myanmar defenders to drill a left-footed into the net. It has been an odd sort of tournament for Younghusband, the country’s top marksman but unable to stamp his mark until this game. Quality, it is said, eventually shines through. Tonight, Younghusband showed why he is the scourge of defenders around the region. The goal would never have come without the vision of another of the country’s heroes – the unsung Jason de Jong, whose quiet patrolling of the middle limited Vietnam to no more than hopeful shots from deep in midfield. De Jong the thug was being himself when barely escaping a red after a nasty tackle in the 10th minute. But de Jong the visionary was the one who set up Younghusband’s goal with the sort of pass that Steven Gerrard would have proudly called his own. Myanmar, it has to be said, had their chances. When they did get behind the Philippines’ goal, they lacked the quality to make their forays count. There was also the little matter of another of the Philippines’ heroes. Eduard Sacapaño, thrust into the limelight by the unavailability of Europe-based Neil Etheridge and Roland Müller, has been having a quietly effective campaign. Whenever Myanmar got behind the excellent central defensive partnership of Rob Gier and Juani Guirado, Sacapaño was there to mop up the litter. Because Vietnam was losing 1-3 to Thailand in the other fixture which was being played simultaneously, there was every incentive for Myanmar to try and get a result from this match. They never stood a chance. Carli de Murga – who had to play through despite a clash of heads early in the game – and Dennis Cagara were as unbreachable at fullback as the Gier-Guirado partnership in central defence. With Myanmar pushing forward for a late equaliser, they inevitably exposed gaps at the back which Angel Guirado duly exploited in the 3rd minute of added time. Guirado latched onto a long clearance just past the halfway mark, sprinted towards goal, held off the attentions of a Myanmar defender before burying a shot which ensured that the Suzuki Cup would be finally coming to Manila for the semi-finals.